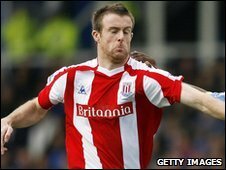 Stoke City midfielder Michael Tonge has joined Championship side Preston North End on loan. The 26-year-old, who moved to the Potters for £2m from Sheffield United in September 2008, will stay at Deepdale until 28 December. "I'm delighted to be at Preston," Tonge told BBC Radio Lancashire. "I need to get out and play some football. "They have a good team here and they play good football, so hopefully I can help the team pick up more points." Tonge has not featured in the Premier League this season, with his three appearances coming in the Carling Cup. In total, he has made just 14 appearances for Tony Pulis' side, but still feels that he has benefitted from his time at the Britannia Stadium. "I enjoyed it because it was a new experience for me going to another club," added Tonge. "It's the first time I've moved and they're really good group of lads down there at Stoke. "It's been frustrating from a footballing perspective because everybody wants to play. Last season I was involved in most of the games, but this season I've not figured so it's disappointing." Tonge will go straight into the Preston squad for Monday evening's clash with Newcastle United. "My initial aim is to try and play as many games as possible for Preston, enjoy it and then Tony Pulis will have to decide what he wants me to do," Tonge continued. "If I'm enjoying it here I'd like to stay, but we'll just have to see what happens at the end of the loan."